You may have already seen my post, "MY VISIT TO THE 2018 ALLERGY & FREE FROM SHOW AT LONDON OLYMPIA". (If you scroll down a few posts, it's still up on the blog). I mentioned that I came home with a blogger's goody bag containing gifted products. The three products that I was most interested in were BAIE BOTANIQUE Rose Renew Regenerating Serum Anti-Ageing, ORGANIC SHOP Tropical Coconut & Shea Hair Mask and SAMPURE MINERALS Crushed Mineral Eyeshadow. I was looking forward to trying these "NATURAL HEALTH" magazine award-winning brands. Today I am writing about BAIE BOTANIQUE Rose Renew Regenerating Serum Anti-Ageing, which has been "formulated to aid in cell renewal and regeneration". For a couple of weeks now, I have been applying a small amount of BAIE BOTANIQUE Rose Renew Regenerating Serum to my face and neck before moisturiser, as suggested. I have found in the past that with natural skincare products from luxury brands, using them can be a very pleasant, almost holistic experience because of their scent and texture. This one is no exception. The rose fragrance is beautiful and the serum has a lovely syrupy feel. Does BAIE BOTANIQUE Rose Renew Regenerating Serum do what it claims to do? Well, yes I find that it "softens" and "brightens" my skin and "enhances overall complexion" and because of this, it has the effect of "improving the appearance of fine lines and wrinkles". I do think that It makes my face look healthier and gives it a glow. I would certainly recommend this lovely product and at £34 for 30ml, pricewise it compares favourably with other luxury brands of natural skincare. 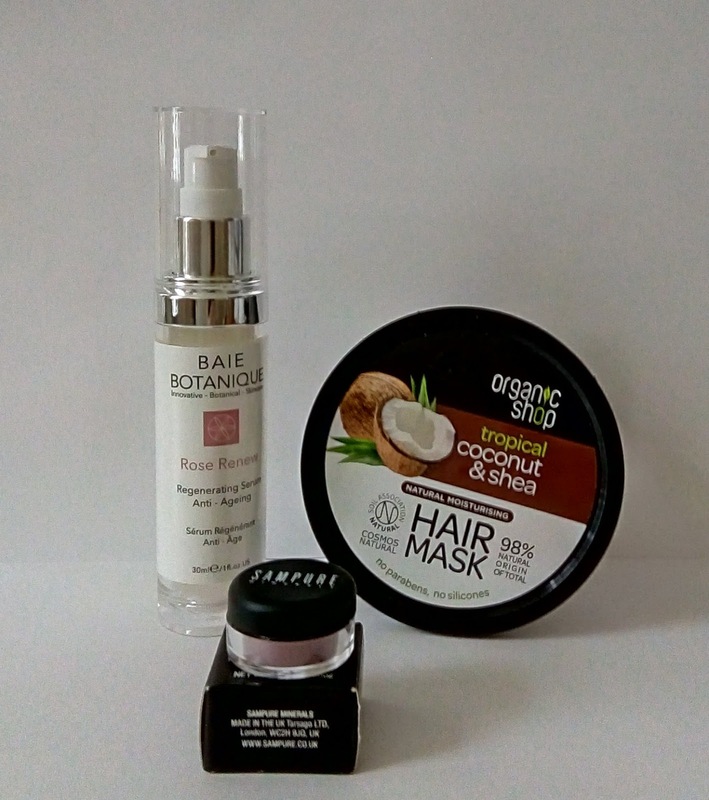 I will very shortly be testing and reviewing ORGANIC SHOP Tropical Coconut & Shea Hair Mask and SAMPURE MINERALS Crushed Mineral Eyeshadow, so please keep posted.